Produced from 1908 to 1927, the Model T Ford was the first car affordable enough for the average American working family. Over 15 million were produced during those years, making it the most common car in America at the time. While many were scrapped to help the war effort of WWII, there are likely hundreds of thousands that still exist. The Model T was both simple and versatile. 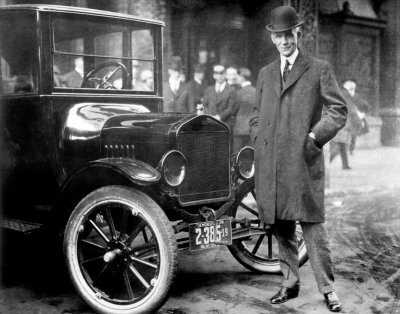 Interchangeable bodies on essentially the same chassis, along with Henry Ford's use of the assembly line continually reduced costs and the final price of the car, which was less than $300 by the end of production. It had a 20hp engine, two-speed transmission, and a top speed of 40-45 mph. You can read more about the Model T here. For more detail, the Model T Encyclopedia is also available online. The Model T Ford Club of America was founded in Los Angeles in 1965. Active membership includes all privileges of the club, plus six issues of The Vintage Ford magazine. The Model T Ford Club International was founded in Chicage in 1952. Active membership includes all privileges of the club, plus six issues of The Model T Times magazine. The Rose City Model T Club was founded in Portland in 1963. Active membership includes all privileges of the club, plus a monthly issue of The Timer Newsletter. Membership runs from November 1 to October 31.